Posted by Katy Foley on February 1, 2019 at 10:06 AM. Filed under Around the Home, Power . Tidying up and keeping things in order is an everyday goal but more often than not, the chaos of the week leaves organization tasks for another day. Jasco partnered with some incredible bloggers and had them try out our favorite Cordinate Extension Cords to see how one item could help improve their coordination at work and in their homes. Whether it's juggling family needs, coming up with ideas and creating content or meeting deadlines, these full-time bloggers are actively hustling around daily to get things done. 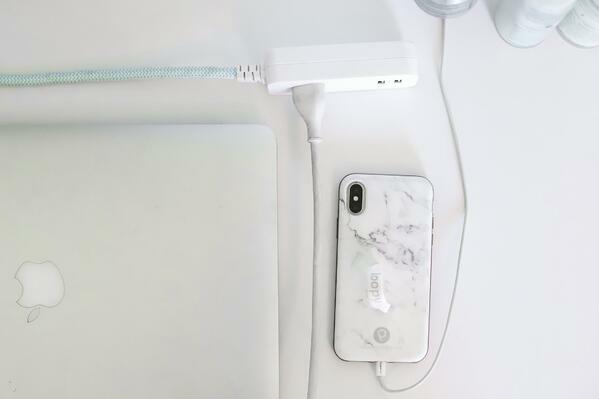 Here’s 5 unique ways each of the bloggers used the decorative extension cords to quickly organize their individual spaces. Credit to Peppered in Style blog. 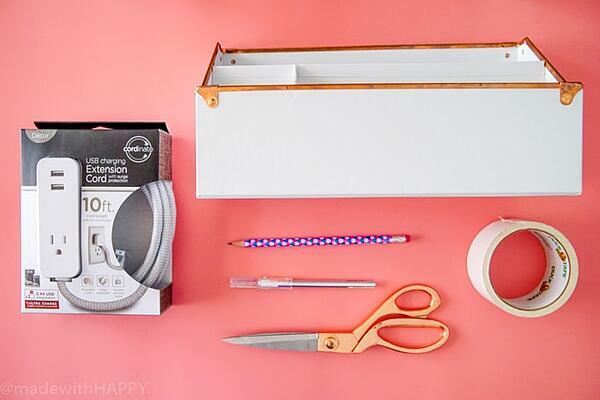 This blogger knows the stress of a messy desk all too well. When trying to brainstorm new creative content or hustling on projects already in the works, the chaos of clutter has gotten in her way. After using a Cordinate Extension Cord in her workspace, she no longer has to worry about the spider web of cords around her desk. 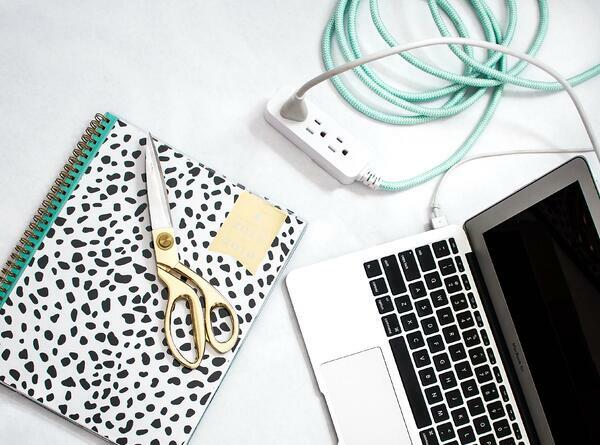 The mint fabric cord cover also complements her office décor so it's pretty as well as clean- a style blogger's dream. Credit to Made with Happy blog. Back to school time meant organization was underway for this blogger. She kicked off the new school year with a project to get off to a good start! 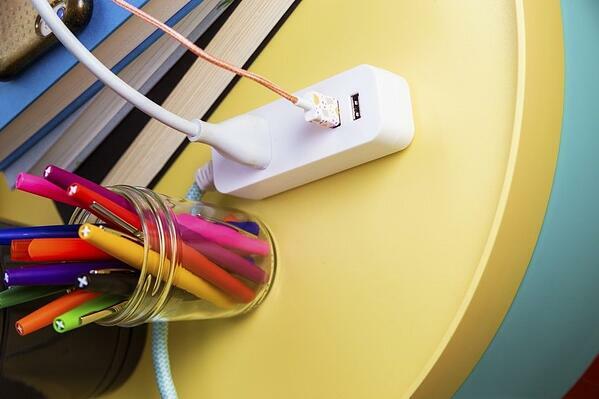 By cutting a hole in a cardboard desk organizer and simply placing her Cordinate Extension Cord into the box, she created a DIY charging station for her kids desk that hides the cords altogether. With 10 ft. of extended reach and a flat plug, she can have the desk anywhere in the room or up close against any wall. Credit to Being Summer Shores blog. The importance of having all of her tech charged throughout the day is a main concern for this blogger. Using Google calendars and spreadsheets all day to organize scheduling for her business, she needs to keep her laptop, phone, camera and other devices charged to meet every deadline. Needless to say, Cordinate came in handy to keep the power flowing into all her tech necessities through the multi-port cord with 2 USB ports and 1 grounded outlet. Avoiding dead batteries, she can utilize every minute while working from home! Credit to Our Potluck Family blog. Anyone with school aged children knows the struggle with a lack of time! Between work, school, dinner, cleaning, sports and all the other activities that consume the day, sometimes homework runs later into the evening. 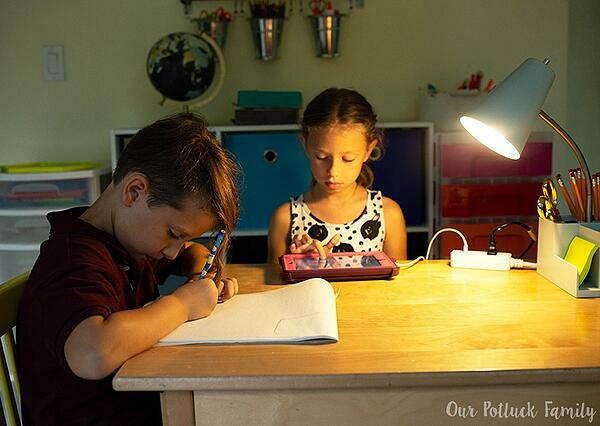 To fit everything in and still get the work done, this blogger uses Cordinate to bring light to her kids' homework area. She especially appreciates that the extension cord has tamper resistant outlets and surge protection from possible harmful voltage spikes so her children and devices are always safe, even during a stormy night. Credit to Mom Spark blog. Sending off your kids to college isn't easy, but this blogger found some relief in helping her son with his packing list before heading off to school. One of the essential items on the list was the Cordinate extension cord. In an effort to simplify and connect all her son's electronics without the extra clutter, they found one of these cords that fit all their targeted needs. The USB ports are convenient for forgetful moments when you can't find block plug-ins for wall charging!